I love my pantry. This may be an unusual favorite room of the house, but for me it is a place of comfort and a source of pride. Come visit my home and I’ll be sure to show you my special place. Though it is not often in perfect order, my pantry is my sanctuary. In our small home, this is the place where I can escape (briefly, until someone finds me) the commotion and demands of the other members of the family. Inside its walls I store my stacks of cookbooks, the baskets of garlic, squash, and potatoes harvested from last summer’s garden, and of course my canned goods. My pantry shelves are full of all the grains, beans, seeds, and more required to make almost anything I can dream of. And then there is “my pantry shelf.” This particular shelf is full of all of my favorite tastes of the various seasons, harvested and processed, canned to enjoy year round. There is the applesauce from my parent’s apple trees, the blackberry jam, from last summer’s walk along the creek, the salsas from the late summer tomato extravaganza, the pickled corn, okra, green beans, and zucchini. “My pantry shelf” not only satisfies my families desire for diverse tastes year round, but it also is an archive of our garden and our life. Just looking at the jars brings me a deep sense of satisfaction. Evidence of hard work and good times spent in the garden and kitchen. The bulk of my canning is done in summer. I spend days (and more often nights- after the kids have gone to bed) sweating over the canning pot every August and September. There is a fever that drives my need to put food up. Though by the end of the season, I vow off the jars. My shelf is full and I have to force myself to turn my back on any more abundance that threatens to inspire me. Luckily, with a break of a few months, I am ready to can again. Many jars, once full, are ready to be refilled. 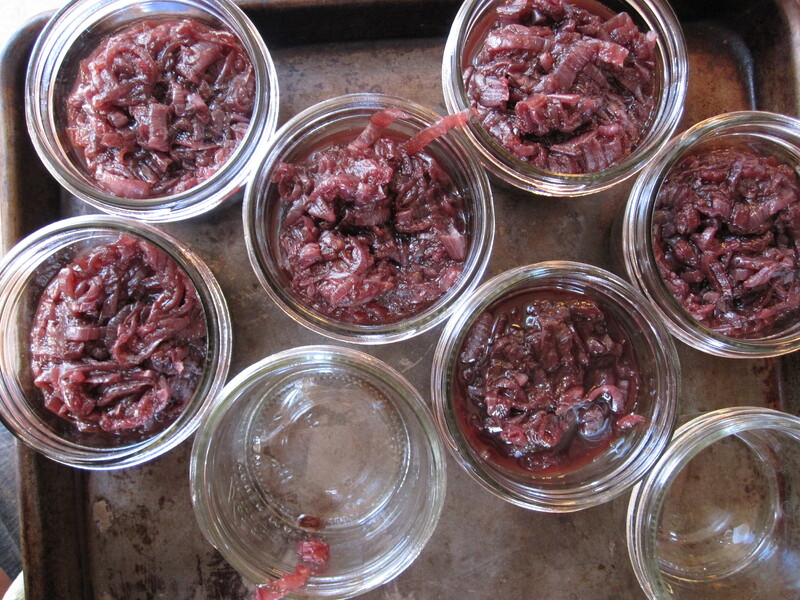 In winter, I break out my pot, jars, and lids and make Caramelized Onion Relish. This sweet and tangy relish is incredible. 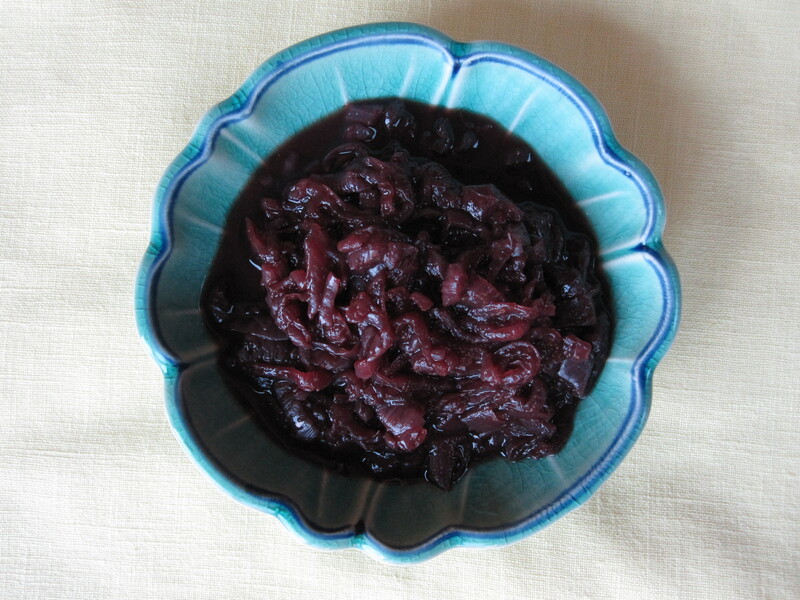 It is basically caramelized onions cooked down with wine, sugar, and vinegar. We serve it as an appetizer with goat cheese, alongside grilled meats, or atop a burger. It is outstanding on a pizza with Manchego or other sharp cheese. This relish keeps well in the fridge for a few weeks, freezes well, and of course, can be put up in jars as well. It is an excellent pantry staple or hostess gift. IMPORTANT: if you intend to can this, do not use oil! The onions will provide plenty of moisture to the pan. Place the onions in a pot over medium heat. Stir in the sugar. Cook uncovered for 3o minutes or so, or until the onions are soften and start to brown and caramelize. Stir frequently. If the onions produce a lot of moisture, cook down until liquid has almost completely evaporated. Stir in the wine, balsamic vinegar, salt, and pepper. Bring to a boil, then reduce heat and simmer15-20 minutes until the liquid has reduced and begins to thicken. Taste and correct seasoning. 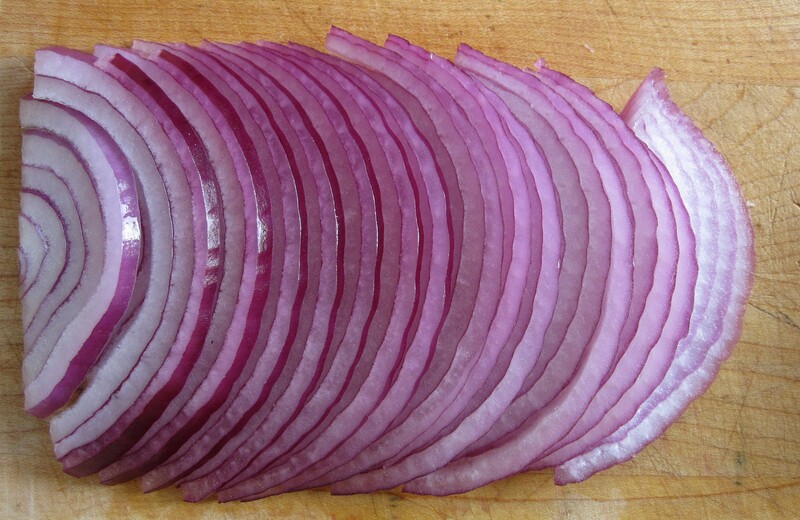 Note: The cooking time will vary widely depending on the water content of your onions. The times given are based on average supermarket onions. If you have fresher onions, they will require more time for the moisture to evaporate. 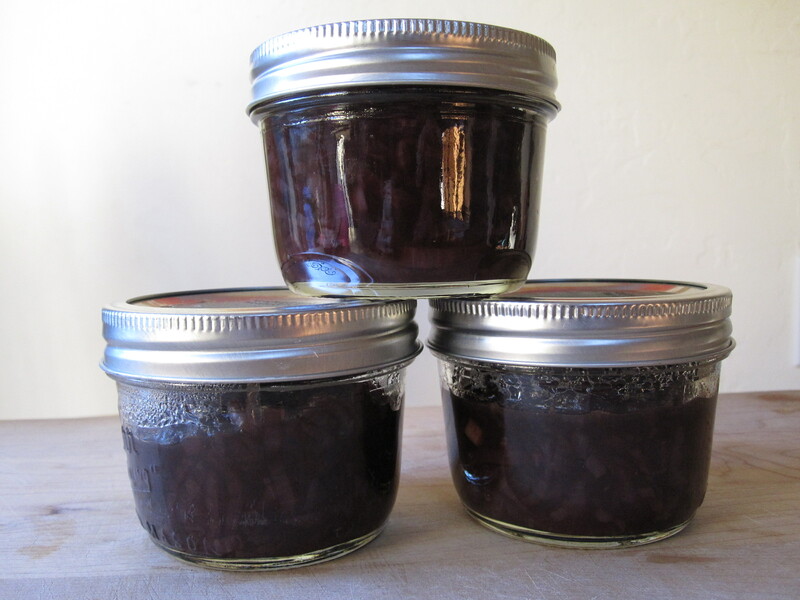 Ladle relish into hot sterile jars. Leave a 1/2 inch head-space. Process in a hot water bath for 10 minutes for half-pint jars. 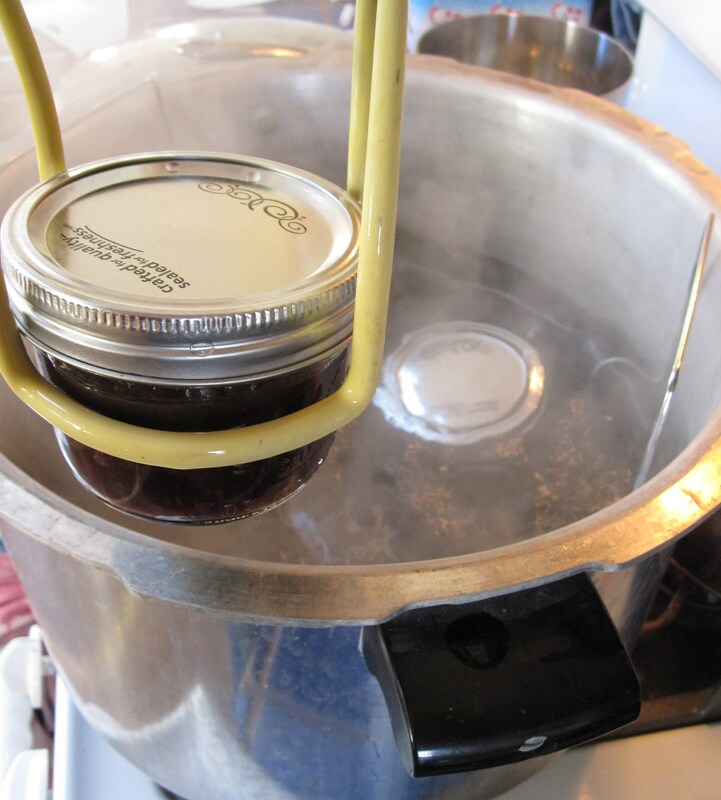 See Home Canning Basics for more information about the canning process. This relish also freezes well in case you don’t want to bother with canning. Try this relish on Southwestern Chicken Burgers! This sounds amazing! I can’t wait to try this! Have you tried your gingerbread with whipped cream and your caramel sauce yet? Yum, I always add butter though. I am interested to taste it without. My favorite use of this is as a base on homemade pizza instead of tomato sauce! I still haven’t gotten around to canning, but I think you have inspired me to do it. Any good canned lemon recipes? I can not wait to try this recipe- I can with my husband as a “hobby” and we are leaning more toward a sustainable household… this recipe looks great! This makes an excellent onion dip with 8 oz cream 1/2 cup mayonaise, 1/2 cup sour cream, creamed together and add 1 cup of onion relish. The flavor improves overnight. This recipe got me Best in Canning at the Dutchess County Fair one year. We love to make a “Greek pizza” with the relish as a base on homemade dough, feta and black olives. Herbs to individual tastes. YUM! THIS looks absolutely delicious!!! And that dip sounds great too..I am going to have to try this. I have canned in the summer before..but this winter I am enjoying it to with making different types of marmalade..and I am hoping I will make this too!!! I made blog oranage Marmalade recently..check it out on my blog if you are interested!! I’m totally making this today! And I’m so glad to find that someone else keeps a *basket* of garlic rather than just a single head. I *just* made this last week. It’s *awesome* on turkey burgers & swiss cheese. I think this will be a new favorite condiment – I love recipes like this that can be made all year long. I love caramelized onions and make them fairly regularly. They’re great with so many things! I want to try your recipe next! What is the pizza that you made with this onion relish? what kind of cheese? It was with “our favorite pizza dough” crust and Manchego cheese. It can’t hurt to toss a little fresh thyme or rosemary on there as well! thank you! making it tonight. absolutely, I don’t use any other pizza dough any more, unless I need it fast! I want to practice this recipe to make some for gifts at Christmas time. How long will the jars stay good? The general rule of thumb is one year, but they will be good past that point as well. I tried this, entirely delicious, but only ended up with 1 300ml jar plus a few spoons. That was with 700 grams of onions, probably not enough, so it has a lot of wine in it 375mls. Can you quantify what a ‘large onion’ is? I note you water bath versus pressure can. Is that because the vinegar and brown sugar make it safe? The plain carmelised onion recipes are specifying pressure canning. Thanks. Looking forward to making this with the last if this summer’s bounty. Yes, the vinegar reduces the pH making it safe to process in a water bath. I note that you somehow preserve fresh beans. My mother-in-law used to preserve beans in salt. She has passed away a long time ago now and no one can remember how to preserve fresh beans. Would you be so kind and let us know your method or recipe. We have an abundance of beans at certain times and give so much away. We’re still happy to give some away, but would also like to preserve some.